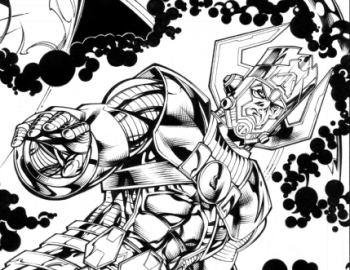 [UPDATE] Marvel vs. Capcom 3 Comic Artist Accidentally Confirms Galactus? Alleged images from the Marvel vs. Capcom 3 comic adaptation posted in an artist's online portfolio have seemingly confirmed that the Marvel and Capcom heroes will be battling the world-eating Galactus and some other dude. Earlier this month, an anonymous Twitter poster supposedly leaked the remaining roster of characters for Capcom's highly-anticipated crossover brawler. Mike Haggar (Final Fight), Hsien-Ko (Darkstalkers) and Akuma (Street Fighter) would be representing Capcom, whereas Taskmasker (a Captain America villain), famous X-Person Jean Grey/Phoenix, and a mutant-hunting Sentinel robot would be joining the fray on Marvel's side of things. The game's final boss would be the planet eater, Galactus. Earlier today, artist Kevin Sharpe - who is reportedly working on the Marvel vs. Capcom comic book - uploaded some images of the comic to his personal portfolio. As well as depicting things that are just blatantly silly - like Chris Redfield taking on the Hulk with a shotgun (really, Chris? It'll just make him angry, and you wouldn't, etc etc.) - the images showed both Galactus and Taskmasker alongside the characters already announced for the game. The images have already been taken off of Sharpe's portfolio, but much like an elephant the Internet never forgets - they're all up on Shoryuken. While this still isn't an official confirmation of anything, it makes the information leaked via Twitter seem that much more likely. And here I was crossing my fingers that Capcom would suddenly surprise us with Phoenix Wright or Frank West (again). Alas, it is not to be. How sad. Update: We have been informed that the source of these images was not actually Kevin Sharpe's portfolio as originally posted. There is no word where they do actually come from - this could be a hoax, or someone else could have been behind the leak and sought to deflect blame onto Mr. Sharpe.